With the letter recently received to all Central States Pension Fund participants, and the pension changes looming, there are advocacy groups springing up all over the country in hopes of stemming the changes proposed. These groups include some based right here in Wisconsin. The Wisconsin Committee to Protect Pensions was established by two retired L200 members, Bob Amsden and Bernie Anderson, and both are working tirelessly to promote the message and enlighten anyone willing to listen to the devastating effects these changes may bring to all CSPF participants. The ultimate change they are looking to gain is funding to the Pension Benefit Guarantee Corporation (PBGC) to keep our pensions whole. This group of retirees and active members, and their goal of funding the PBGC are in the best interest of all Central States Participants whether living in Wisconsin or elsewhere. Please consider helping these dedicated retirees and members with a monetary donation made out to the name and address below. Right now some retirees across the country are facing enormous cuts to the benefits they earned through years of loyalty and service to their employers. Congress caused this problem last December by rolling back a decades old provision preventing cuts to promised retiree benefits. To make matters even worse, Congress allows retirees to vote on the cuts but any ballot that goes unreturned is counted as in favor of the cuts, and even if the beneficiaries vote against the cuts, the Treasury still has the right to require cuts to pension benefits. Legislation sponsored by Senator Rob Portman and Representatives David Joyce and Tim Ryan, the Pension Accountability Act (S. 2147/H.R. 4029), will give plan participants a meaningful voice when plans are considering making cuts. The legislation requires a majority, binding vote from plan participants before any cuts may be made and only returned ballots will be counted in the vote total. Take Action Now! In addition to the Pension Accountability Act, the Teamsters Union continues to support S. 1631/ H.R. 2844, the Keep Our Pension Promises Act (KOPPA). KOPPA would protect workers and retirees from cuts to their earned retirement benefits. The legislation would restore anti-cutback rules so that retirees in financially troubled multi-employer pension plans would be protected from having their earned benefits cut. We want to ensure that our nation’s retirees will have a voice when it comes to cuts in benefits that were earned over a lifetime of service. We urge you to email your Senators and Representative to ask them to sign onto S. 2147/ H.R. 4029, the Pension Accountability Act. As active members and retired members receive their letter from the CSPF the reality of the dire situation our fund is in becomes very real and very personal to us all. We, as participants, have been receiving notification for years in regards to the issues facing the funding levels and what it could mean and why. Now we are here. What can I as an active or retired member do? Each member of the fund, active or retired, should read ALL the information they recently received from the fund. It outlines your very individual scenario in respect to your benefit past and future. There are retiree advocacy groups meeting and fighting the daunting task of repealing current law, and then passing legislation to fund the underfunded pension funds like our own. It is no easy task. Please take the time to learn about your fund. Understand as best you can why your personal benefit is what it is. And if you have questions or concerns of any kind follow the instructions outlined in your mailing and write a letter and ask the fund. Be as specific as you possibly can. The Central States Pension Fund Trustees. US Treasury Dept. Holds Pension Forum in Milw. Mr. Feinberg has been appointed by the Obama Administration and the Treasury department to oversee the submission of, and approval or denial of, plans submitted by multiemployer pension funds that are underfunded and looking for change. “We are here to bring the voice of the members of this local to Mr. Feinberg and the Treasury department” said Tom Millonzi, Principal officer of Teamsters Local 200. Tom Bennett, President of Local 200 is shown addressing Mr. Feinberg. 49 others followed Tom at the microphone as each gave their opinion of the Central States Pension Fund plan being considered by the Treasury Department. 310 retirees and actives and their spouses were in attendance. Teamsters General President Jim Hoffa joined Sen. Bernie Sanders (I-Vt.), Rep. Marcy Kaptur (D-Ohio), retiree advocates and hundreds of retirees on Capitol Hill today to call on Congress to protect the earned retirement benefits of millions of American retirees and workers. Under a new law, millions of union workers and retirees across the country are at risk of not getting their pensions as promised. Many in Wisconsin are concerned and are headed to Washington D.C this week to speak up. The concerns began in December, after congress passed the Multiemployer pension reform act. "The government passed a law in 2014, which is going to allow any multiemployer pension fund to reduce pensions 30 to 60%, if the trustees are in declining condition with no proof," said Bob Amsden, who is a member of the Local Teamster 200. He's also one of 10 million retirees across the country who could face pension cuts. "I drove trucks for 33 years for 5 companies... every job we had we knew our pensions were promised and guaranteed by the government, " Amsden said. But now that promise is in limbo because of the new law. That's why Amsden started the "Wisconsin Committee to Protect Pensions" in January 2015. "This isn't going to be just a teamster issue... this is going to affect 1,400 multiemployer plans which are carpenters... electricians.. plumbers," Amsden added. The Wisconsin committee will travel to Washington D.C this week with 20 of it's members to speak up about their concerns. "Going out there to testify in front of the Treasury Department to tell them how devastating this is going to be to us if they don't do something to stop this," Amsden said. 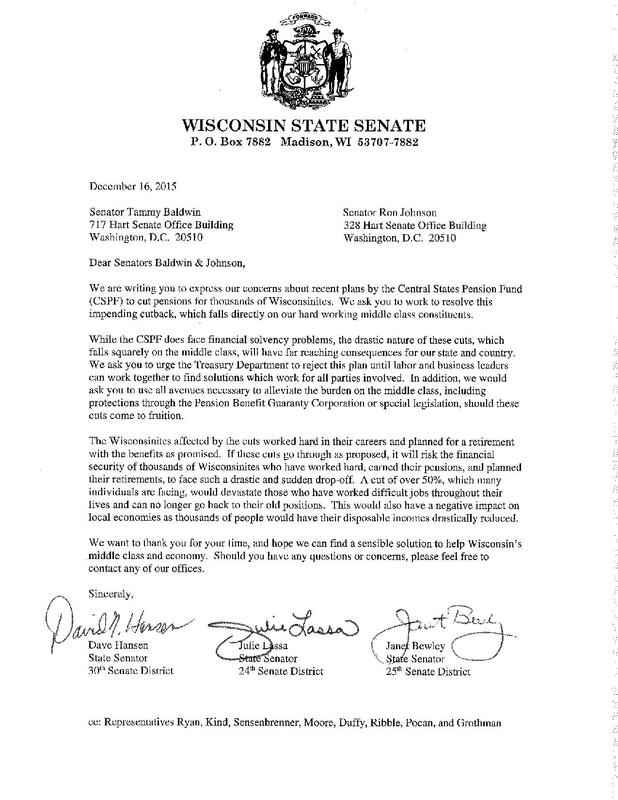 In June, Senator Tammy Baldwin signed on as an original cosponsor of a bill called "The Keep our Pension Promises At." The bill was introduced by Senator Bernie Sanders and it could reverse the pension cuts. The Wisconsin committee is scheduled to meet with Senator Baldwin, Republican Senator Ron Johnson and other legislators on Thursday about the proposed bill. It's unclear when the pensions could be cut, but if congress doesn't act, it could happen as early as 2016. Happy Labor Day to all Local 200 Teamsters!! As promised this office will forward to all those members of interest any and all information received to this Local from the Central States Pension Fund. Please see below a letter from my desk to the pension Fund Trustees, and the answer received. Tuesday April 14th both at noon and 7pm a report was given to all in attendance about the Central States Pension Fund letter recently received by participants. “Like has been told to both the retirees and the active members of Local 200 repeatedly, we will report to you any and all information forwarded by the Fund to your Local leadership in regards to Central States and the recently passed changes to the Multiemployer Pension Reform Act of 2014” stated Local 200 Secretary Treasurer Tom Millonzi. “We did just that yesterday. Retirees as well as active members at both meetings were attentive and engaged.